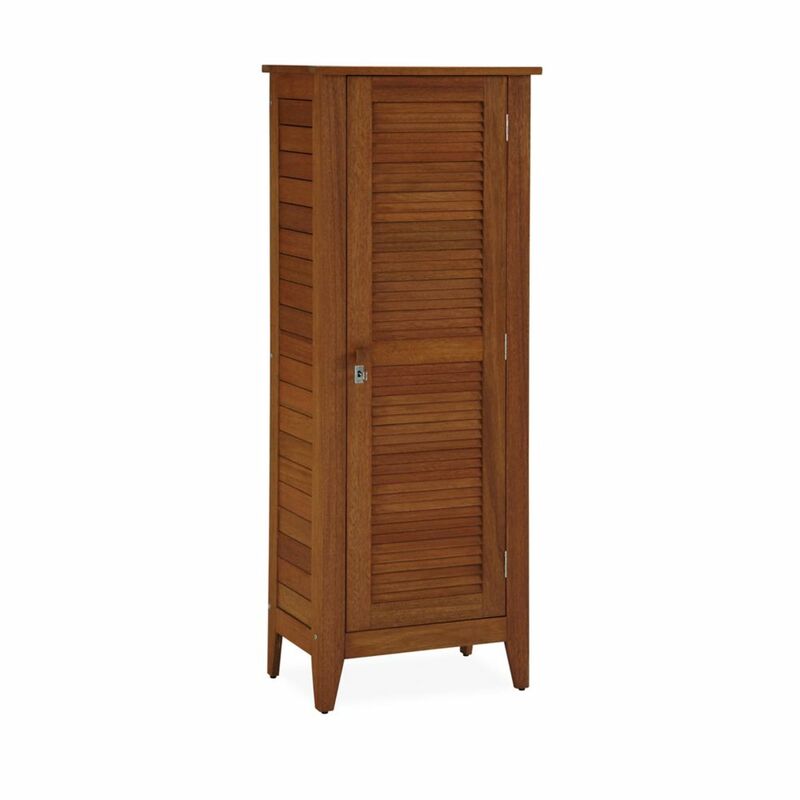 Shorea Wood One Door Multi-Purpose Storage Cabinet Montego Bay One Door Multi-Purpose Storage Cabinet by Home Styles is just what you've been looking for to meet your outdoor as well as indoor storage needs. Showcasing an island inspired design in a versatile Eucalyptus finish and constructed of eco-friendly material. Shorea Wood One Door Multi-Purpose Storage Cabinet is rated 4.7 out of 5 by 6. Rated 5 out of 5 by HomeDepotCustomer from The cabinet was very easy to assemble. The door... The cabinet was very easy to assemble. The door took some tweaking to close properly but otherwise no complaints. Rated 4 out of 5 by dumpsterman1 from Easy to assemble, could use nicer (brass?) hardware which would... Easy to assemble, could use nicer (brass?) hardware which would be counter sunk all over, as the ones on top were, but not all. Rated 5 out of 5 by Steve from The best cabinet we have ever owned for outside. Perfect... The best cabinet we have ever owned for outside. Perfect size! Rated 5 out of 5 by Norcay from Love this Cabinet!! The cabinet was easy to assemble and looks great!! It's very attractive looking and perfect for my use. I'm using it to store towels for the pool and small pool toys and it's perfect. Very happy with this product. Rated 4 out of 5 by CCMax from Good looking design in a sturdy wood cabinet Open slat design, using solid wood throughout. Sturdy product that has nice teak colored finish and adjustable shelves. I plan on use outside on deck which has a 3 ft overhang, so it is partially covered. Recommended to bring indoors for harsh weather or winter. I will re-coat with linseed oil each year to protect and maintain finish. I used liquid soap on steel screws, as the hex wrench supplied was awkward to get a good grip and and completely tighten.